The Making of Nu, Pogodi! This article was originally written as a Russian-language LiveJournal post by Vitaly Dubogrei. It was translated to English by Sophia Rhem while on her Home and Abroad: Translation program. For Russians, the characters from Nu, pogodi! have been our friends since the cradle. One is a young guy with shaggy hair and a guitar on his back, who ambles along in bell-bottoms and a worn-out shirt, smoking a cigarette and enjoying a life free of obligations. He’s an anti-social type. The other is small but tricky, and spends his life running from the first guy and playing dirty tricks on him on the sly. This is the Wolf and the Hare. This is the best animated duo in the history of the animation studio Soyuzmultfilm. Nu, pogodi! (Well, Just You Wait!) came to be thanks to an order from the government – Communist officials decided give Disney cartoons a proper response, and allotted what was, for the time, a solid budget to do it. The young, popular, and reasonably well-known humorists Aleksandr Kurlyandsky, Arkady Khait, Felix Kamov, and Eduard Uspensky were invited to the Soyuzmultfilm studio, and asked to make something funny. Kurlyandsky and Khait came up with the premise. They decided it would revolve around a chase. They considered various characters as they debated who would chase whom: they thought at first that they would use a fox and a rooster, and then a fox and a hare, before finally settling on a wolf and a hare, as the characters most consistent with Russian folklore. Their innovation, in their opinion, was that the wolf was goofy – not a Disney villain, but a character who always ends up falling into the traps he sets for others. Kamov initially collaborated in developing the series, but only Kurlyandsky and Khait remained involved. The history of the cartoon begins even before the release of the first, well-known, episode. In 1969, director Gennady Sokolskiy shot an original short film, the central idea of which was to form the basis of the famous series. His versions of the Wolf and the Hare fell victim to the censors, however. He was urged to fundamentally change the personas of the characters, to make them more refined – the leadership considered the Wolf and the Hare too malicious, and believed that Soviet children needed good heroes. The artist did not make the alterations, and refused further work. Later, the graphics, humor, size, and appearance of the characters were changed, but the central idea remained the same. “The Hare came to me right away,” recounted Kotyonochkin, “with blue eyes, pink cheeks; generally very likeable. Kotyonochkin wanted singer/actor Vladimir Vysotsky to voice the Wolf, and made samples of his raspy voice. Vysotsky approached the task enthusiastically, and even planned to write a song for the Wolf. But the censors interfered – the singer was removed from the project. The incomparable Anatoli Papanov was approved for the part instead. As a tribute to Vysotsky, in the first episode the Wolf whistles the tune of his song featured in the film The Vertical (“If a friend suddenly turns out to be…”) as he climbs a rope up to the Hare. Actress and singer Klara Rumyanova got the part of the Hare without a problem. The cartoon was already receiving accolades after just the first episode. Beginning in 1969, a new episode was aired each year. The epithet “national” was strongly associated with the series. More than once, Kotyonochkin was ready to part with the Wolf and the Hare and put an end to the cartoon, but he yielded to the popular demand of his audience. Nu, pogodi! is the story of everyday, commonplace life in the 1970s, the everyday life that isn’t documented by official sources, and survives only in the Russian’s collective memory. Instead of making a cartoon about “good and bad,” Kotyonochkin succeeded in creating a socially acceptable cartoon that was openly ironic and rebellious. The characters on the screen are readily recognizable types. The cocky Wolf can still be found around certain residential neighborhoods in the evenings. The Hare ended up being more of a small beast than a positive hero. His weakness is feigned. His small size and modest physique force him to be resourceful, but guided by his innate cunning, he manages to provoke the Wolf, and mock him to his heart’s content. They live the most ordinary lives, so to speak. After ten episodes, the Hare settles into a cozy, one-room apartment. The Wolf lounges in his bachelor pad, with tattered wallpaper on the walls. The cityscape surrounding them consists of five-story Khrushchyovkas. It took a long time to find a phrase for the title that would not only be consistent with the plot, but would also promise the viewer more to come. Various options were discussed: Nu, podozhdy (Well, just wait! ), Nu, pogodite! (Well, just you [formal] wait! )… But Felix Kamov put an end to the dispute with Nu, pogodi! (Well, just you [informal] wait!). When Kamov – one of the show’s writers – left for Israel, which was then considered tantamount to treason against the state, the authorities played it safe and canceled Nu, pogodi! Sometime later, Papanov was awarded a prize at the Kremlin. Nikolai Podgorny, the chairman of the Presidium of the Supreme Soviet of the USSR at the time, wanted to know how Nu, pogodi! was going. “There’s a conflict at the studio. Someone went abroad,” Papanov answered. “Well, someone also stayed!” cried Padgorny, adding: “By the way, I like the cartoon, as do my children and comrades.” Papanov related the conversation back at the studio, and soon the cartoon was back in business. The animated series features a number of popular melodies from 1960-1980, many of which were taken from the archives of the All-Union Radio, or from the personal record collections of the series’ sound producers. Nu, pogodi! features the music of Alla Pugacheva, Chico Buarque, Herb Alpert, Rimsky-Korsakov, Digital Emotion, Bill Haley, James Last, Pesniary, Zemlyane, Edita Piekha, Muslim Magomayev, Paul Mauriat, Franck Pourcel, Earl Scruggs, Igor Sklyar, and others. The music during the opening credits of each episode is the Hungarian melody Vízisí (Water Skis). The song was written by Tamás Deák, and performed by Hungarian vocal ensemble Harmónia, and the group Magyar Rádió Tánczenekara (Radio Dance Orchestra). In the1970s, cartoon programs on Central Television usually followed a short animated intro (later used as the prologue to the three Nu, pogodi! television installments). To the accompaniment of the Nu, pogodi title music, the Wolf chased the Hare, and they were gradually joined by other popular cartoon characters. The whole company ended up in the Ostankino Television Center where the Hare, his eyes glued to a television screen, brushed off the Wolf’s attempts to catch him: “Shh! Well, just wait.” The Wolf turns to the screen, forgetting about the Hare. After Papanov’s death, the question of whether or not to put an end to the cartoon arose once again. But it turned out that the sound technician had carefully preserved all the recordings of the actor, which could be used in new episodes after his death. Out of respect for the artist’s memory, it was decided that his voice would not be replaced by someone else’s. In the new episodes, the heroes were drawn not by the elder, “progenitor” Kotyonochkin (he’s no longer living), but by his son, a professional artist. 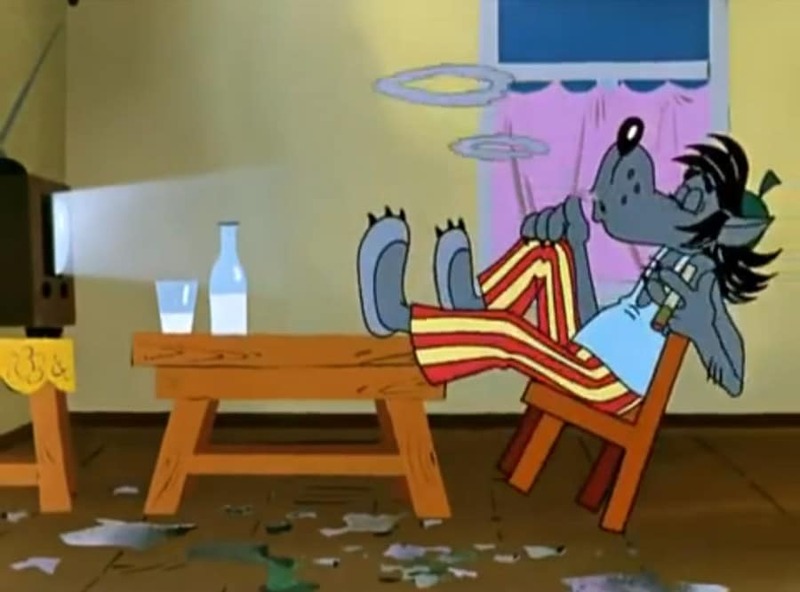 Papanov’s role in voicing the Wolf was taken by Igor Khristenko, who acted in Yevgeny Petrosyan’s TV show Crooked Mirror. One installment, called “Don’t touch!” (1977) criticized the quality of the products being produced by glass factories. In this clip, the Wolf rephrases his customary threat: “Well, glass-works, just you wait!” Another installment, called “Sucker Punch” (1978), criticized advertisements in the newspaper Soviet Sports about admission for athletes to post-secondary educational institutions (“Well, editors, just you wait!”). Both installments were directed by Vyacheslav Kotyonochkin. Other installments were shot during the same period, dedicated to defective shoes (Amazing shoes), and musical instruments (False Motif). Yury Butyrin also shot the public service ads Window, Crane, Coil Spring, Elevator, and Bathtub (all in 1986) using the same characters, and in 1987 there were at least nine public service ads featuring the Wolf and the Hare. Aleksandr Fedulov made: Not Knowing the Code…, In Spite of the Hare!, Uneasy Night, and Warmth. Vadim Medzhibovsky made: Yes There Will Be Light!, Might, Recipe, Word and Deed, and Turn Off the Light On Your Way Out. The characters’ appearances in these short films differed from their original designs. There is an animated film called The Magic Camera, made by request of the company TsRKO Rassvet (Soyuzmultfilm, 1976; director -Viktor Arsentyev; screenwriter Arkady Khait; artistic directors – Vladimir Krumin and Alkesandr Vinokurov), dedicated to the promotion of amateur film. The clever animated story advertises the video camera Quartz 1x8S-2. The film features the heroes of Nu, pogodi – the Hare and the Wolf. In 1994, Vyacheslav Kotyonochkin also shot a commercial for Joyta brand candy using the Nu, pogodi! characters. The Wolf was voiced by Vladimir Ferapontov. A final episode in the history of Nu, pogodi! followed an August 2012 debate in the All-Russia State Television and Radio Broadcasting Company. The debate involved categorizing cartoons according to a law, passed in 2010, “On the protection of children from information harmful to their health and development.” A rumor circulated on the internet that Nu, pogodi would be rated 18+ due to scenes of violence and smoking, and shown uncut on television only after 11 PM. In the ensuing discussion, it was proposed that the cartoon be excluded from the categorization due to its cultural significance. At the beginning of September, various websites reported that the issue had not been with the cartoon after all, but with restricting a Swedish film, with the same name in Russian, which came out in 2008 and was rated 18+. Watch three hours of Nu, pogodi below!